Pratheepan Gulasekaram is a professor of law at Santa Clara University. In his reflection on Justice Anthony Kennedy, Harvard Law School professor Jack Goldsmith suggests that three principles animated Kennedy’s landmark opinions: dignity, capacious liberty from government interference and a robust conception of judicial power. Judging from his opinions and votes in immigration cases, however, Kennedy was an unreliable adherent to those principles, oftentimes disregarding the dignity and due process claims of noncitizens, and pleading for a diminished judicial role in critical immigration matters. This legacy was cemented by Kennedy’s last writing as a justice of the Supreme Court in Trump v. Hawaii. There, his final concurrence admonished the president for disregarding constitutional limits, while still casting the critical fifth vote to leave in force a presidential directive that his concurrence hinted was designed to make good on a promise to ban Muslims from the country. At first blush, Kennedy’s Hawaii opinion may seem shocking. Outside the immigration context, he was vigilant when federal, state and local governments acted in bad faith against politically unpopular groups. He famously authored Windsor v. United States, Romer v. Evans and Church of Lukumi Babalu Aye v. City of Hialeah, all cases in which he discounted the government’s justifications for the laws at issue and unearthed the unconstitutional animus that lay underneath. It is equally true that Kennedy often rejected a shrinking role for the federal judiciary, even when dealing with the executive branch, or when national security concerns loomed large. Kennedy joined the five-justice majority in I.N.S. v. St. Cyr, which preserved habeas rights for noncitizens in the face of Congress’ attempt to strip federal court jurisdiction over immigration cases. He concurred and joined Justice John Paul Stevens’ five-justice majority in Hamdan v. Rumsfeld, stopping the George W. Bush administration’s initial attempt to use military tribunals to try enemy combatants from Guantanamo Bay. Later, in Boumediene v. Bush, Kennedy’s opinion for a 5-4 majority helped establish the limits on the political branches in their attempts to eliminate the habeas rights of alleged enemy combatants detained at Guantanamo Bay. Yet, absent in Kennedy’s assessment of Trump’s immigration ban were his demonstrated ability to ferret out unconstitutional motives targeting disfavored minorities and his record of preserving access to federal courts to curb political branch excesses. Considered with his critical “swing” votes in other significant immigration cases, Kennedy’s jurisprudence reflects an inclination to ensure a judicial forum in which to present constitutional claims, only to deny any substantive relief to the noncitizen before the court. In retrospect then, Kennedy’s opinion in Hawaii should have been foreseeable, as it tracked his approach in a number of cases in which he shied away from meaningful judicial oversight over the federal government’s control and treatment of noncitizens. In some cases, Kennedy appeared willing to acknowledge the necessity of invoking constitutional safeguards, but seemingly diluted those protections because they emerged in the immigration context. This equivocation is evident in cases like Verdugo-Urquidez v. United States, Nguyen v. I.N.S. and Kerry v. Din. In Verdugo-Urquidez, a plurality of the court held that the Fourth Amendment did not extend to federal agents’ search and seizure of a noncitizen criminal defendant’s property in Mexico. While the plurality read the term “the people” protected by several provisions of Bill of Rights as stringently circumscribing the class protected by those provisions, Kennedy’s concurrence instead suggested that “the people” emphasized the importance of the right, rather than the category of persons protected. Although he rejected the plurality’s attempt to exclude noncitizens from constitutional protection, he nevertheless provided the fifth vote to deny the criminal defendant Fourth Amendment guarantees. That pattern continued in Nguyen, in which Kennedy’s opinion for a five-justice majority upheld a distinction in the Immigration and Nationality Act that makes it significantly more difficult for an unwed father to pass on citizenship to his child than it does for an unwed mother. His opinion offered the possibility of normalizing constitutional standards for immigration laws, which the Supreme Court has resisted reviewing under mainstream due process and equal protection principles, when he purported to apply the intermediate scrutiny standard to evaluate the INA’s gender-based classification. Yet, Kennedy’s opinion invoked outdated stereotypes about men and women and their relationship to their offspring to come to its conclusion. Last year, though, in Sessions v. Morales-Santana, Kennedy joined a seven-justice majority that struck down a different INA provision that also discriminated against unwed fathers’ ability to transmit citizenship, signing on to an opinion by Justice Ruth Bader Ginsburg that all but discarded Kennedy’s prior reasoning. Nevertheless, his opinion in Nguyen still stands, and for several years has ensured that equality principles play weaker in the immigration and family context than they do in other regulatory areas. Similarly, in Din, the court denied relief to a U.S. citizen who sought information from the government as to why her spouse had been denied a visa. 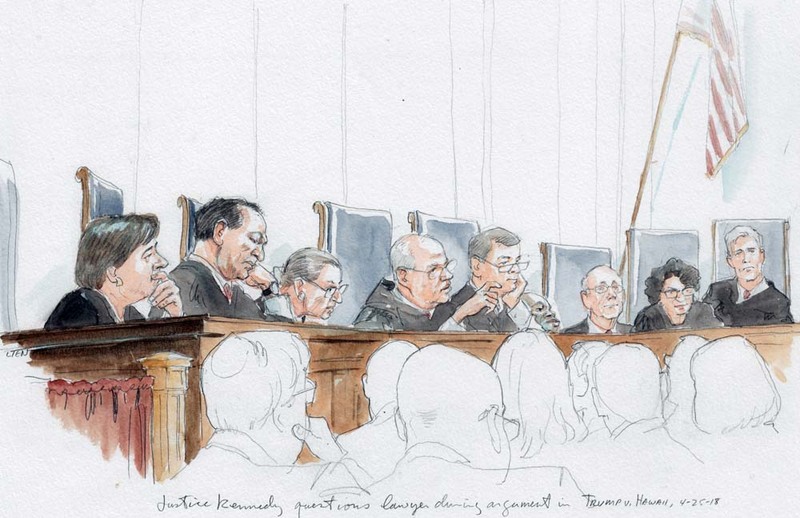 Kennedy concurred separately to note that a plurality of the court had needlessly denied the noncitizen’s ability to raise a due process claim. But again, this rhetorical gesture proved empty. Ultimately, in providing the critical fifth vote yet again, Kennedy argued that the bare minimum of governmental response – a citation to the code section used to deny the visa – would suffice to meet whatever constitutional process rights the noncitizen, or his citizen-spouse, was due. His rulings in both Din and Nguyen, both of which denied close family members the full legal benefits of their relationships and threaten to separate spouses and children, are especially surprising in light of Kennedy’s most well-known opinion. In Obergefell v. Hodges, which established a constitutional right to marriage equality, Kennedy’s majority opinion sought to protect intact family units, and rejected the idea of forcing families to relocate in order to remain together. In addition to his tendency to invoke constitutional standards, only to deny substantive relief, Kennedy also voted to justify and extend the use of immigration detention. These decisions conflict with his commitment to the inherent dignity of personhood, a concept he exalted in other contexts. Kennedy’s views on the constitutional rights of noncitizens in immigration detention came into focus with his dissent in Zadvydas v. Davis. In that 2001 case, a 5-4 majority of the court held that the INA provision allowing for detention of deportable noncitizens whom the government could not actually remove had to be read to include a presumptive six-month time limit so as to avoid the grave constitutional concerns raised by indefinite detention. Kennedy critiqued the majority for “rushing to substitute a judicial judgment for the Executive’s discretion,” and argued that the protections already afforded detainees in removal proceedings were sufficient. Two years later, with the events of 9/11 intervening between the cases, Kennedy was able to vindicate aspects of his Zadydas dissent when he provided the fifth vote in Demore v. Kim. There, the majority upheld the prolonged detention of those in removal proceedings, allowing noncitizens to be locked up for years as their removal cases were heard. Kennedy’s concurring opinion joined the majority in full. He wrote separately only to emphasize that he might consider a constitutional challenge when an immigrant’s detention became unreasonable or unjustified. Kennedy’s opinions leave significant uncertainty as to what set of facts, if any, might have moved him to find a due process violation. Perhaps more importantly, it was later revealed that the government’s representations to the court about average length of a noncitizen’s incarceration – statistics the court and Kennedy in particular relied upon to reject the due process claim – were wrong. Despite this revelation, Kennedy left no doubt about his position on immigrant incarceration when he cast his vote in Jennings v. Rodriguez earlier this term. There, siding with another five-justice majority, he found no constitutional problems with reading INA provisions to justify the prolonged imprisonment of several classes of noncitizens without individualized bond hearings, including those with no criminal background and those seeking asylum. It is true that Kennedy’s opinions at least recognized the possibility of noncitizens accessing federal courts to present their constitutional claims. In Din, for example, his concurrence held out the theoretical prospect that in some instances, the government’s motives in denying entry should be subject to more searching judicial review. Even in the detention context, his opinions ostensibly left open the chance that any particular individual’s incarceration might violate constitutional standards. Yet, read through the lens of his swan song in Hawaii, these past decisions seem to showcase Kennedy’s reluctance to vindicate substantive individual rights claims brought by noncitizens, rather than realistic opportunities for noncitizens to seek substantive relief. Moreover, his votes in the detention cases evince unwavering support of an expansive federal power over immigration detention. Taken as a whole, Kennedy’s immigration jurisprudence demonstrates that his bold strides towards protecting the liberty and dignity of personhood were limited to some vulnerable minorities, but did not extend to persons covered by immigration laws and policies. His final concurrence in Hawaii, warning that this current president may have exercised discretion in a manner that violated the First Amendment but declining to check that discretion, seems to flow from Kennedy’s earlier immigration decisions. Yet, that result was not inevitable given his habeas and gay-rights jurisprudence. In the end, he was a reliable fifth vote for the conservative majority, fashioning an immigration jurisprudence that vindicated the government’s position against the claims of noncitizens.